If you've got leftover grilled vegetables on-hand, you've got the start of our new favourite sandwich! 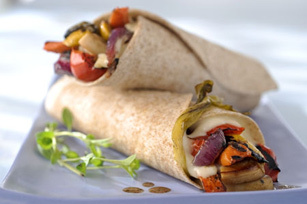 Add some sliced cheese (we used Swiss, but feel free to try cheddar or mozzarella) and you've got lunch all wrapped up! Top tortillas with cheese and vegetable mixture; roll up. This is a great way to use leftover grilled vegetables.